Chuck Miller not only speaks in the same Southern twang as Jed Clampett from “The Beverly Hillbillies,” but he kind of looks like him, too. Dressed in a straw cowboy hat and a button-up shirt tucked into his jeans, the silver mustachioed farmer’s destiny, however, didn’t lie in black gold – instead it was in corn whiskey. Along with his wife Jeanette, Miller owns Belmont Farm Distillery, where he produces a true American spirit: moonshine. The homemade corn whiskey is made in the Appalachian tradition using a recipe passed down from his grandfather, a real bootlegger who supplied thirsty flappers with the drink during Prohibition. “We make it all the way from scratch, and we use the old time methods,” explained Miller, the master moonshine distiller. Even though you can purchase Miller’s corn whiskey in stores throughout the country (and in some cases abroad), one can only get a true taste for the spirit by visiting the distillery, which lies off a dusty road about 15 minutes from downtown Culpeper, Virginia. The couple’s distillery sits in the middle of a cornfield and was built using the remains of a church that burned down in the 1960s. The only leftover evidence of the building’s former incarnation is a pair of peaked doors that lead to the gift shop and the start of a distillery tour, which is open to anyone who passes by. If your lucky, Miller himself will lead you on the tour. As you wind your way through the tiny distillery, he’ll spout off facts about the Prohibition-era copper pot he uses and allow you to take a big whiff of the drink as it’s being made (if you can handle it, that is). You’ll also understand why this drink became known as “white lighting,” a nickname given because it’s bottled straight from the still without any aging. This method was developed so that bootleggers – including Miller’s grandfather – would be able to produce the spirit quickly. But just because Miller’s moonshine is made quickly doesn’t mean it’s made with any less expertise or enthusiasm, a fact that becomes immediately clear within moments of stepping into the distillery. Miller himself has encyclopedic knowledge of the drink. As you’ll see on the tour, the resulting spirit is clear like a vodka and although it smells a bit like rubbing alcohol, it goes down smoother than many other whiskies. And even though the drink is technically a whiskey, this is one place that you won’t find on the American Whiskey Trail. Tours of Belmont Farm Distillery are offered Tuesday through Saturday from April 1 through December 24. Groups of 12 or less depart every 15 minutes. I must admit that despite my name I’ve never been much into whiskey. Rum? Yes. Beer? Yes. Wine? Yes. Absinthe? Yes. Mead? Oh yes! But whiskey has never really been on my radar. A taste of 25-year-old Scapa whiskey changed all that. Scapa prides itself as being the second northernmost Scotch whisky distillery in the world. Highland Park Distillery beats it by less than a mile. There are more northern whiskey distilleries in Scandinavia, but of course those aren’t Scotch whisky distilleries. The Scapa distillery was founded in 1885 and sits on the southern shore of Mainland Orkney. I met with Ian Logan, International Brand Ambassador for Chivas Brothers, to take a look around this distillery that’s otherwise closed to the public. As we entered, Logan explained that Scapa is a small operation that produces 120,000 liters of single malt whisky a year. I thought that sounded like a lot but my guide simply shrugged. 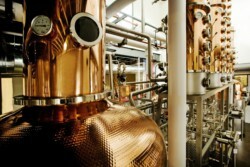 “A major distillery will do that in two weeks,” he said. Scapa only has three employees who work equipment that’s a mix of the old and new along with a few museum pieces. The mill, for example, is 75 years old and was built by a company that no longer exists. Their still is a Lomond still from the 1930s and the only one still in operation. This equipment works just fine for a small distillery like Scapa so there’s no reason to change it. “A distillery is all about consistency,” Logan explained. After the sifting and milling, a combination of local spring water, sugar, and starch is poured into the mash as it’s slowly turned. Two more infusions of water follow. Fermentation takes 135 hours and then it’s sent to the Lomond still to be distilled. %Gallery-161374%After the whisky cools, it’s put into 190 liter casks on site. “Not many places fill their own casks these days. Most send it to a central point,” Logan said. The casks are all American white oak, which lends a vanilla flavor. As Logan took me around the rows of casks in their warehouse, I noticed most of them were stamped “Jack Daniels.” According to U.S. law, barrels may only be used once. They are then sold to the UK where they’re reused. Used casks are actually better for Scapa’s purposes because that first use gets rid of the stronger flavors and later uses give a mellower whisky. Casks are reused three times for single malt whisky after coming from the U.S., and then are used for blends. “It’s a terrible analogy but a cask is like a tea bag. The more you use it the less you get from it!” Logan joked. Logan then sat me down to try their 16-year-old and 25-year-old samples. I lack the vocabulary of the connoisseur, so let me just say that I found both to be mellow, smooth and rich with a velvety texture. I could certainly taste the vanilla that comes from the American oak, along with hints of other flavors I couldn’t quite put my finger on. Logan offered me some water to mix with it but I found this diluted the delicate flavor. This newbie drinks his whisky straight. If you can’t find Scapa at your local liquor store, you can order it from many online retailers and also find it as one of the elements of the popular Ballantine blend. For those who love whiskey and live in the United States or are planning to visit, you’ll love this new infographic. The good people over at Sloshspot have kindly and ingeniously created a map detailing some of the best whiskey distilleries around the country. If you’ve ever needed some inspiration to plan a U.S. road trip, or just can’t decide which route to take, let this map be your guide. The infographic not only tells you where to go to sample great whiskey, but also what to expect at each distillery in terms of fermentation and style. For example, you can see that in San Francisco, California, there is Anchor Brewing Company, which makes non-Kentucky bourbon, and that in Chicago, Illinois, there is Koval Distillery, where you can try American rye whiskey. A very large chunk of the graphic is dedicated to Kentucky and Tennessee, where you’ll find majority of the country’s whiskey distilleries. If you’re having trouble viewing the infographic, click here.